Diamond engagement rings are also extremely versatile. They can be worn in the daytime or the evening and still look fabulous. Diamond engagement rings do not have to be huge to be gorgeous either. Diamonds are so full of color and sparkle that even small ones are dazzling. If it comes down to price you are much better off buying a smaller good quality stone than a larger poorer one. Not all diamonds are created equal and knowing the difference is knowing what ring you should be buying. When you are shopping for diamond engagement rings you need to remember that diamonds are supposed to be crystal clear with no visible inclusions. It may be hard to find a diamond that has no inclusions at all but most people are not going to be taking a diamond loupe to their ring so as long as it is not visible to the naked eye you are doing fine. The clarity rating of the diamond will determine how many inclusions there are in the diamond. A diamond that has a clarity rating of SI1 or SI2 will give you good value for the money and the inclusions will not be visible to the naked eye. 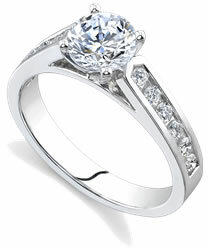 Diamond engagement rings are always a popular choice among men and women. Diamonds match whatever you wear. You will never find a piece of clothing that does not match a diamond. Not many stones can boast the same. Colored stones may look pretty in the shop but on the hand of your loved one they may not look so great. Different people can wear different colors. What looks smashing on one will not necessarily look fabulous on another. It all comes down to skin tone. Diamonds are safe and reliable, not to mention hard and strong. Unlike many other stones, diamonds are very durable and can last longer than sixty years making it a great aspect of diamond engagement rings. Traditional engagement rings have diamonds with no color in them.